Finally, it’s here. The Cafe Lattes Tres Leches Cake. If you follow me (please do!) you might remember a blogging fail when I dropped the Cafe Lattes Tres Leches Cake in February, The Cake of Broken Dreams. Well, here it is again! With Easter coming soon, and right after, Cinco de Mayo, I knew this cake couldn’t wait until next Valentine’s day. The Cafe Lattes Tres Leches cake is perfect for either holiday or any spring or summer party. If you don’t know about Tres Leches cake, the name comes from three milks that are traditionally used in & on the cake. It’s popular all over South America and it’s a beautiful thing. The Tres Leches Cake is absolutely creamy, dreamy perfection. It’s also super easy to make. The hard part is getting the frosting smooth, at least for me coz I’m not too much of a decorator and my hands were getting shaky by the time I was done. I watched a few youtube videos, which helped, but I might just go free form next time with a few swoops and peaks. Also, I kept trying to smooth the top and took off too much of the frosting. There’s always next time, right? I should have refrigerated this, too, before cutting…mine got a little squishy! Photo of Grand Avenue by Bill Lindeke from this Minn Post article. As far as the recipe, Cafe Latte is practically an institution here in the Twin Cities. It’s located on historic Grand Avenue in St. Paul, which is such a fun place to visit with shops & restaurant galore. I’ve mentioned Cafe Latte, before; their Turtle Cake is our preferred birthday cake so I was psyched that the Quinn’s shared their Cafe Lattes Tres Leches Cake on WCCO. I only made a small, little adaptation to the cake – I used a stabilized whipped cream for the frosting, and I’m pretty sure Cafe Latte does, too. Refrigerate this cake for a few hours or overnight if you have time so it firms up a bit before cutting. Photo of Cafe Latte from their site. It’s helpful to make the cake the day before, then make the whipping cream and frost it the next day. The Cafe Lattes Tres Leches Cake is a great make-ahead option & keeps very well, uncut for two days in the fridge. What’s leftover, if there is any, is still pretty decent for four days, maybe beyond. Just adding up the cost of all the cream is enough to make me gasp. Buy at Aldi or wait for a sale because cream is great holiday sale item & keeps for weeks in the fridge. You could cut the whipped cream back by half to lower the cost and just frost the middle and the top of the cake – it would still be gorgeous. And choosing seasonal fruit is always a good call. I couldn’t resist raspberries, though! Condensed milk is another holiday sale item and there are usually coupons available. Half & half is just 1/2 milk & half cream. Milk runs about $2.75 a gallon in my area and has 16 cups/gallon, so that’s 17 cents a cup. If you’re going to buy a pint (2 cups of 1/2 & 1/2) it should be no more than the cost of an 8-ounce container of cream + the 17 cents. A creamy, dreamy “three milks” cake from the famed Twin Cities eatery, Cafe Latte. Butter an 8” round pan. Line the bottom with parchment paper, then butter and flour, shaking out any excess flour. Preheat oven to 350 degrees F.
Combine oil, sugar, eggs, and vanilla in a large bowl. In another bowl, sift together flour, baking soda, baking powder, and salt. Add dry ingredients to oil mixture. Add buttermilk in stages, stirring (a wooden spoon works well) until the mixture is wet enough to accept the rest, being careful not to overbeat. Pour into the round cake pan, bake for 20-25 minutes until cake is golden brown and when pressed lightly in the center, springs back. The top will be slightly rounded but will even out as it cools. Cool in pan about 10 minutes, then remove to a rack to cool completely. Combine all ingredients with a whisk, then pour into a bowl or measuring cup with a spout. When cake is cool, slice in half horizontally so there are two 8” round layers. Arrange cut side up. Slowly pour soaking liquid over the cake layers. In a small saucepan, add the water then sprinkle gelatin evenly over the top. Let sit for several minutes until gelatin softens and becomes translucent. If it doesn’t become translucent after about10 minutes, place the pan over medium-low heat for just a few seconds until gelatin starts to melt. Remove pan from heat and swirl to distribute heat and fully melt the gelatin. Slowly mix in about 3/4 cup of the cream, set aside. In the meantime, add cream to mixing bowl and beat just until soft peaks form. Beat in the sugar, then with the mixer running, slowly add the gelatin cream mixture. Turn mixer on high and beat until very stiff peaks form. The whipped cream at that stage may not look quite as smooth as “regular” whipped cream but will smooth out as it’s spread. 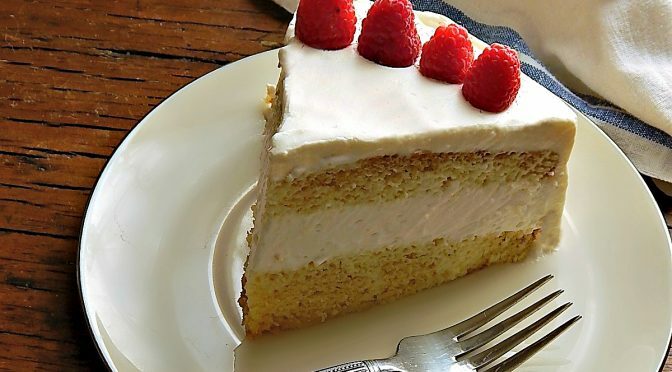 Place one layer of cake on a cake plate, cut side up, and top with 1/3 of the whipped cream, then smooth it. Place the second layer on top of the whipped cream, cut side down, then to the top, add another 1/3 of the whipped cream and smooth it. Frost sides with the remaining whipped cream. For best results, refrigerate for several hours before cutting. Store in the fridge, keeps very well for two days, if you’d like to make it ahead, but is still good after several days in the fridge. No buttermilk? No problem. Add a teaspoon and a half of vinegar to a measuring cup. Add milk until it reaches the 1/2 cup mark. Make sure to measure the soaking liquid exactly or you’ll end up with a cake that is too dry or worse, too wet. If you need a recipe to use the rest of the condensed milk, check out the Fake Frappe recipe right here on my site. Garnish with fresh berries; Cafe Latte uses raspberries. For best results, refrigerate for several hours before cutting. I’ll be bringing this cake to Fiesta Friday #215, hosted this week by Laurena @ Life Diet Health and Alex @ Turks Who Eat. We’d all love it if you stop by & see a collection of recipes and posts by the fantastic food bloggers who’ve joined in. This entry was posted in Click here for Fabulous Food Posts and tagged Buttermilk, Cafe Latte, Cake, condensed milk, Cream, Desserts, gelatin, Half & Half, Tres Leches Cake, whipped cream. Bookmark the permalink. What a beautiful cake! Can you believe that I’ve never made nor eaten a tres leches cake? I’ve had it on my list, but you just made it move up! I can’t wait to make one and dig in! Hi Carlee, I love Tres Leches and you’ve got to try it = this was my first layered Tres Leches and it is such a beautiful thing! I was able to taste the cake through your description of it and how to make it! Hi Nora, what a lovely compliment on the Tres Leches cake! Thanks you! I’m confused about the water and gelatin. How much water and gelatin before you add 3/4 cup of the cream? Thanks….tres leche is my favorite cake. HI Monica, I can see why the confusion! My apologies. I’ve updated the recipe!! This cake looks amazing! I love the big layer of frosting in the middle 😀 Thanks for sharing at Fiesta Friday! I would love to see how beautiful you would make this, Angie!! But yes, it is a bit dangerous for me to have anything sweet around. I’ve been wanting to make my Chocolate Granola which needs some shavings from a good chocolate bar. Well three times I’ve bought that bar and all three times ate it, lol!! I am craving for anything cake and it seems like I have the answer now. The thing is – you have to make me this, Mollie.😂 Looks so so good!! Thanks! Honestly, I think it looked even better in person. I still might have to have another go at it though…I promised a friend! lol! Well, I’m not really sure if I see the problem, hahah!! You’re so right, it is worth it! 🙂 And thanks for the pin, Rhonda!! Thanks much! This is one that I’ll make over and over this spring and summer! Thanks! It was so good! I also pleased to see the recipe for this after becoming very curious about it the last time you posted about it…i will definitely be trying it at some point! And after the last disaster, I just couldn’t let it go without remaking!! Thanks Jess. It’s just right, i think – sometimes they’re too dry or too wet, but this was just beautiful. Great recipe idea. I have a Caramel Tres Leches coffe recipe on my blog. I’ve had Tres Leches Cake and I like it. Tres Leches coffee sounds fun! I’ll have to check it out. I can’t do straight coffee, but I do seem to like the fancier ones! this is so delicious – great post!!! Thanks! i do have to admit it is divine! I think it and variations of it will become a family thing. Thanks so much…there was a time I wouldn’t have deviated from chocolate but I’m glad I did. It’s an intriguing cake … I’ve thought of making it a time or two but it seemed very rich and fattening. lol, yes!! I am not a huge whipping cream fan, so I wondered if I could eat this, but I think that there’s hardly any sugar in it (well comparatively speaking) & that helped keep it from being too, too much. Small pieces and admittedly a bit of a share with Chance (and I know I shouldn’t have!) helped! It was so incredibly good! I didn’t run the nutritional numbers…was afraid to!! I’m’ glad! I’d call this a must have in a cake collection. Plus I love that it’s two layers; seems fancier. Hi Sheree, thanks, and it was. I’m afraid it was dinner one night, lol! And probably the only cake I didn’t want milk with.